In the design process a great amount of attention has been paid to the selection of materials, this is fundamental in the realisation of the product. We produce beds in both hard woods and composite materials. The hard woods we used are primarily, Ash, Cherry, Maple, Oak and Black Walnut. These are all North American Temperate Hardwoods, and are prized by wood workers for their working properties and durability, and by furniture buyers also for thier durability as well as for their beauty in grain patterns, colour and figure. http://www.ahec.org/forest/hdwdrsrc.htm - the American Hardwood Export Council. The situation for topical hardwoods in reference to Africa and Asia is not similar and for environmental reasons these timbers should not be bought. All our timbers and veneers are hand selected to find the best matches, however, timbers and veneers are natural products and as such there is always some variation in grain and colour. For many this variation is the real beauty of wood. Furniture needs to be finished to both protect and enhance the wood. Generally most wood products are finished in a clear lacquer, but the final appearance will vary considerable depending on the type of lacquer and the techniques used to apply it. We offer two main wood finishes. * A low gloss finish that does not close the grain. The finish has a dull appearance but is popular because it presents the wood in a natural state. * A higher gloss finish that will close the grain and present the wood in a brighter aspect giving the impression that it has just been polished. 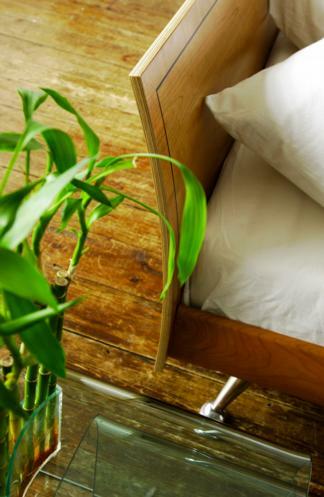 Our headboards are veneered in crown cut and a book-matched veneer. This technique best displays the grain and figure of any particular wood. We make our headboards by bonding Birch veneers together with the appropriate show veneers. These are then forming them over a tool in a heated press. This creates a very strong structure that also has a pleasing edge detail. 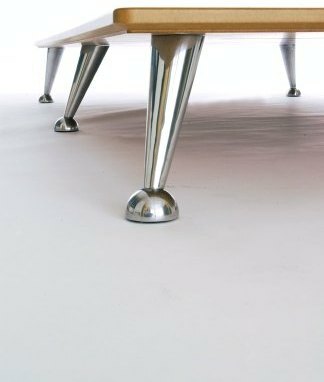 -A pair of beech framed bases; each unit has 33 laminated beech supports mounted on independent sprung shoulders. The supports in the lumber zone paired and have slider adjustment to set the tension. This allows each person to get the support and feel that they require. -Rubber mountings cover all the contact points between bases and the frame to ensure a silent sleep. -Painted tubular steel Tie Bars of 50mm X 25mm x2mm section; are used to add additional strength and rigidity, but also allow the legs to be mounted away from the corners. This is an important safety feature. -The headboards are curved which is an important ergonomic feature. The curve is similar to that of a well-designed chair-back. It provides a very comfortable support for when you wish to sit up in bed, to read, to breakfast or watch TV. -All fittings and connectors are reusable. 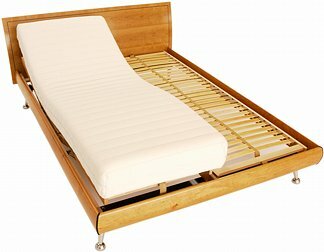 The bed can be assembled and reassemble time and time again with out compromising its initial strength.